Incorrect or insufficient handover information leading to poor management. ‘B5 (1): The building shall be designed and constructed so as to provide reasonable facilities to assist fire fighters in the protection of life’. There is also one other part of the Building Regulations that specifically relates to fire safety - Regulation 38 ‘Fire safety information’. This regulation identifies the need, following building work, to provide the person who is responsible for fire safety in the building with appropriate fire safety information, in order to enable them to understand the fire safety provisions in the building, with the aim of facilitating safe operation of the building. It is this regulation that interfaces with the fire safety regulations applicable to the management of occupied buildings, the Regulatory Reform (Fire Safety) Order 2005. There is also other legislation and regulations that can influence fire safety design, construction and management such as the Housing Act 2004 and the Construction (Design and Management) Regulations 2015. There is a wide range of design guidance available in order to assist in the interpretation of the regulatory requirements and development of an appropriate design. These include Approved Document B (ADB) (Volumes 1 and 2) and British Standards (e.g. BS 9999, BS 9991), as well as others such as the BB100 Design for fire safety in schools and Health Technical Memorandum 05-02 Firecode. Approved Document B ‘Fire Safety’ (ADB) is produced by HM Government and is approved and issued by the Secretary of State for the purpose of providing practical guidance with respect to Part B of Schedule 1 of the Building Regulations 2010. For the vast majority of buildings, ADB is used by designers (typically architects and engineers) as a basis for their fire safety design. However, it is important to understand that ADB is intended to provide guidance ‘for some of the more common building situations’. It is clearly stated in the ADB that there are alternative ways of achieving compliance with the Building Regulations. It is up to the designer to identify whether it is appropriate to follow the ADB or whether an alternative method will be proposed and agreed with the approving authority (i.e. a Local Authority Building Control or an approved inspector). When reviewing existing buildings with incomplete or missing design and construction information, it is important to remember that the original design may have deviated from published design guidance (e.g. ADB). However, the design may still have achieved Building Regulations approval for meeting the functional requirements of the Building Regulations if the designer had developed an alternative solution. The majority of design guidance, including the ADB, is focused on the provisions for fire safety (i.e. life safety), in contrast to considering how a building owner might wish to limit damage to their property or business. However, in many cases, the provision of measures for fire safety may have the advantage of limiting the fire damage - especially in buildings with a large degree of fire separation between spaces (such as residential buildings), or in those with sprinklers. Some guides such as BB100, written especially for schools, also include property protection considerations. 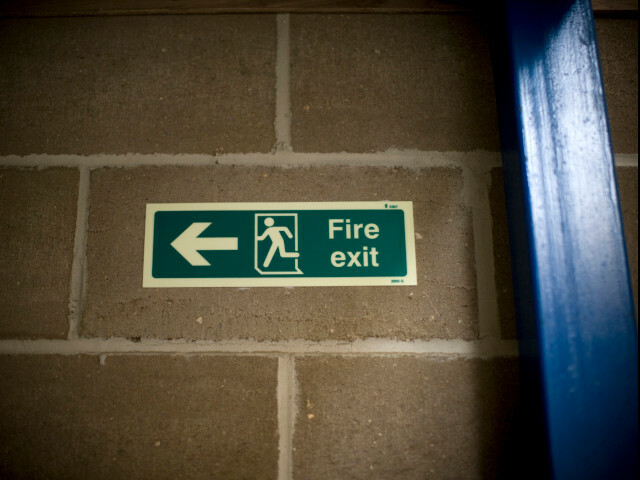 When developing new buildings or planning refurbishments, the potential additional fire protection measures for both property protection and business continuity should be considered by the client, and discussed with the design team, to determine whether additional measures should be included to address those factors. A common failure seen in site investigations relates to Schedule 1 B3 Internal fire spread (structure) Part 3 of the Building Regulations 2010. This refers to the requirement to inhibit the spread of fire within the building, to an extent that is appropriate to the size and use of the building: either by using fire resisting walls/floors and/or an automatic suppression system (e.g. a sprinkler system). This requirement relates to what is referred to as ‘compartmentation’. The concept behind compartmentation is to limit the maximum extent of fire spread that would be considered acceptable, within an appropriate timescale, with reference to relative risks such as the means of evacuation or size of the building. This concept is illustrated with a few simple diagrams in Figure 1. For example, in a residential apartment building, the typical approach would be for the design to limit the fire spread to the apartment where the fire originated. For a tall building (greater than 30m tall), the approach would often be to limit the fire to its floor of origin and to include a sprinkler system. In contrast, for a shop (of limited size), the approach might allow for fire spread over a number of floors. The fire resisting walls and floors that surround those ‘compartments’ will typically have a level of fire resistance that is equivalent to the structural fire resistance of the building (e.g. beams and columns). Any penetrations through those fire resisting walls or floors, such as holes for pipes or cables, will also be fire-stopped. This means that the gaps will be filled in such a way as to maintain the level of fire protection provided by the wall or floor. The factors considered in guidance documents include: the amount of combustible material per unit of floor area; the height of the top floor above ground (which affects the ease of escape and firefighting operations); the occupancy type (which affects the speed of evacuation); whether there are basements; and whether the building is a single storey (where escape is direct to outside). So, for example, it might be deemed acceptable for the structure of a small two-storey detached home to have 30 minutes fire resistance. Whereas an unsprinklered industrial building of that height would be recommended to have at least 60 minutes structural fire resistance. In contrast, buildings more than 30m tall are recommended to be sprinklered and have 120 minutes structural fire resistance (except in very specific circumstances). Therefore, in the case of a building which is greater than 30m tall, the fire resistance of each floor structure (e.g. concrete slab) that separates each level of the building would typically be designed to have at least 120 minutes fire resistance. Any penetrations through the floor slabs would be either fire-stopped, or contained in shafts that are surrounded in walls with 120 minutes fire resistance (e.g. lift shafts or service shafts). Early fire spread between floors would therefore be a potential indicator that there has been a defect in either the design, construction or maintenance of the fire safety provisions. An example of a failure seen by Hawkins was a case involving a three storey apartment building (two standard floors with the third level within the loft space). A fire had occurred in a ground floor apartment, and had been well contained from spreading to the remainder of the ground floor. However, the fire had appeared to spread rapidly up to roof level. A review of the design documents indicated that the apartments had been designed to be fire separated from each other by 60 minute fire resisting walls and floors (Figure 2). The route for services (such as electrical cables) to pass vertically upwards between floors had been enclosed in walls to create a shaft (often referred to as a ‘riser’). The service riser, which penetrated the floors, had been designed to reduce the risk of fire spread between floors by the use of 60 minute fire resisting walls to the riser. However, during the site investigation, it was found that the contractor had not followed the design; the riser was enclosed with combustible construction. As shown in Figure 2, the fire in the ground floor apartment had consumed the shaft wall, entered the riser enclosure, and then spread up the void and back out of the enclosure at both first floor level and roof level. In England, a typical test methodology used as a basis for defining the fire resistance of an element is BS 476-20. With regards to the actual temperature within the test furnace, BS 476-20 defines that the specimen is exposed to what is called the ‘standard temperature/time curve’. This means that the temperature in the furnace is increased at a specified rate over time. This ‘standard’ curve is referred to as a cellulosic curve. This is because it is reasonably reflective of a fire involving materials such as timber furniture, paper and cotton. In a real fire, the heat might increase more rapidly, or more slowly, than this ‘standard’ fire. This is because the development of the fire is dependent upon a number of different factors such as the type and distribution of materials present, the availability of ventilation and type of the surrounding walls/floors. Therefore, a particular type of wall (in this case the wall of the riser), may fail to provide 60 minutes fire resistance in a real fire, even if that is what is stated as the fire resistance given by test. Equally, the wall may also provide protection against fire spread for longer than 60 minutes if the real fire is less severe than test conditions. As defined by the relevant test method, the stated fire resistance also only reflects the time at which certain criteria were exceeded during the fire test. For example, when considering the criteria to be met for a wall to provide sufficient insulation, one example of a failure criterion in BS 476-20 is when the ‘mean unexposed face temperature increases by more than 140oC above its initial value’. Therefore, when considering the cause of rapid fire spread in buildings, careful consideration must be given to the type and quality of construction as well as other factors such as the ventilation conditions and type and distribution of building contents. In the residential case outlined above, based on the available evidence, the standard cellulosic fire test was likely to be appropriate to the type of materials and conditions within the flat. In addition, the fire service had responded to the fire quickly. If the construction had followed the design, then it is likely that the extent of fire damage would have been significantly reduced, potentially limiting the direct fire damage to the floor of origin. Effective fire protection provisions in buildings are reliant on competent design, construction and management. In order to facilitate the appropriate development and implementation of fire protection provisions, clear communication on the division of these roles and responsibilities is essential between parties in a construction project. It is commonplace in the industry that the issue of a completion certificate by Building Control is seen as ‘proof’ that the building has been built to the required fire safety standards. This is a misrepresentation of the role of Building Control. The responsibility to ensure compliance remains with those undertaking the work (e.g. contractors, designers etc). In fire investigations, consideration of both the process and responsibilities during the design and construction of a building can identify a range factors which contribute to fire spread and damage. Sarah Hooton is a Chartered Fire Engineer with a background in fire safety design, construction and management of operational buildings. She has practical experience in designing fire safety provisions in a range of different buildings including low and high rise residential, offices, museums, sports stadia and railway stations. This included the practical application of a variety of guidance documents such as Approved Document B, BS 9999, BS 9991 (amongst others) and assisting architects in achieving Building Regulations approval for Part B Fire Safety. Sarah’s experience means that she is well placed to undertake reviews of existing buildings to identify fire design and construction defects and how this relates to fire spread in real fires. She also has practical experience in assisting in the fire risk assessment process and management of fire safety in operational buildings in accordance with the Regulatory Reform (Fire Safety) Order 2005. At Hawkins, she has investigated a range of defects relating to cavity barriers, fire stopping and fire resisting construction.